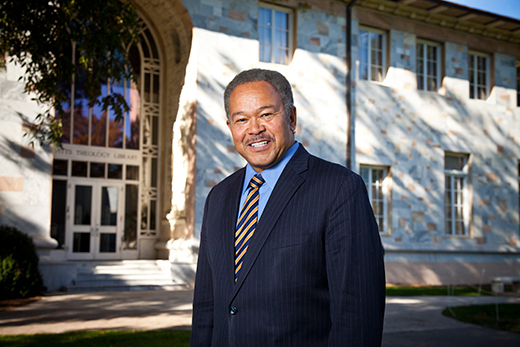 Robert Franklin used his inaugural lecture as Emory’s first James and Berta Laney Chair in Moral Leadership to outline Martin Luther King Jr.’s "animating vision of interdependence," reviewing the current reality regarding race relations and offering a way forward. Franklin’s recent speech at Candler School of Theology, titled "From Here to There: Dr. King's Vision, Our Current Reality and the Way Forward," was set against the backdrop of the nation’s annual celebration of King’s life and legacy and against the glaring racial divides exposed in the deaths of Eric Garner, Michael Brown and others. "Dr. King was animated by a vision, and we should understand our responsibility in implementing his vision," Franklin, whose speech was part of the Dean’s Lecture Series at Candler, told the audience that filled Candler’s Rita Anne Rollins Room on Jan. 21. Franklin framed his points beginning with his favorite quote of King’s: "All people are interdependent . . . whether we realize it or not, each of us lives eternally ‘in the red.’ All life is interrelated. Whatever affects one directly affects all indirectly." King’s vision of interdependence "has been creatively reformulated for our digital age," Franklin said, describing an exercise known as the "Village of 100" or "100 People, A World Portrait" from the University of Wisconsin, which shrinks the Earth's population of 7 billion to a village of 100 people, with all existing human ratios remaining the same in terms of racial and ethnic make-up, education levels, wealth and more. "When you consider our world from such a compressed perspective, the need for cooperation and understanding becomes compelling and clear," he said. "Complicating the achievement of this interdependence (in King’s vision) were and are the realities of prejudice and racism, economic inequality and corrosive poverty, and vicious, destructive violence in all of its manifestations," he continued. Franklin referenced the circumstances under which unarmed men of color face an unacceptably high risk of being killed by a small number of law enforcement officers who regard them through the lens of fear and prejudice. "I note with some pride and appreciation that this seminary community affirmed that it is unacceptable that unarmed young black men should lose their lives in interactions with law enforcement professionals. Candler’s ‘die in’ was a powerful testament to solidarity with the least advantaged members of the community." Public policy, Franklin said, has been responsible for the evolution of urban America's racial polarization during the past century. He cited research by Richard Rothstein from the University of California, Berkeley, who has written that policies developed by politicians and business leaders were clearly intended to create the residential segregation that has been the status quo in urban and small town America. These policies, Franklin said quoting Rothstein, in effect created an American apartheid by allowing racially explicit zoning decisions and restrictive covenants; segregated public housing projects, and denial of adequate municipal services in ghettos. Other policies that contributed to this included urban renewal projects and boundary changes designed to reinforce segregation; and a dual labor market. The result is a legacy of policy-imposed residential and labor segregation; the perception of blacks, especially men, as criminals; and the mobilization of police as agents for protecting the property and persons of those who benefited from these exclusionary laws, policies and informal customs, according to Rothstein. "Amidst the tragic color narratives, there have been, are now and must continue to be moral leaders who transgress the racial and religious boundaries, who break the silence, and act with integrity and imagination for justice and inclusion," Franklin continued. Pointing the way forward, Franklin put forth three zones of moral action that he called on people of faith to engage in simultaneously. The first was police and community relations. "Where they are frayed, moral leaders must step into the places where there is mistrust and fear with visions and values of interdependence, respect and hope," he said. Implementing these visions and values means having difficult public conversations about repairing poor community-police relations through changes in policy, greater diversity in personnel, and through holding law enforcement accountable for professional behavior particularly in communities of color, he noted. The second zone is in what Franklin called the "unglamorous homework of providing care, discipline and moral education for our young people." Franklin cited Candler professor Steve Tipton’s description of the "color coded status quo" when he said "whites must grapple with white privilege and myths of supremacy, a benefit not requested or earned but merely conferred by social systems and codes with deep roots in a racist past." "The third zone," Franklin said, "calls us all out of our ethnic and economic enclaves to the high and demanding work of multi-racial, interfaith coalition building for the common good. Moral leaders do not remain in their zip codes or comfort zones, they venture, they push boundaries, they explore and pioneer new relationships for the common good." And, these mobilized coalitions devote themselves to reengineering our most valued and powerful institutions including government, corporations, houses of worship and universities. He described the work of building coalitions as "heavy lifting" that challenges long-held assumptions about inclusiveness and equity in society’s institutions. How will we know we making progress, Franklin asked, on the journey to the ideal of King’s "beloved community"? When inclusion and equity are coming to be embedded in the culture of the organization and credited, in part, for its excellence and accomplishments; and when leaders and policies are frequently cited and benchmarked for their inclusivity and diversity, he said. Franklin concluded with a quote from the medieval Rabbi Maimonides, "who reminds us that ‘the world is equally balanced between good and evil; your next act will tip the scale.’"